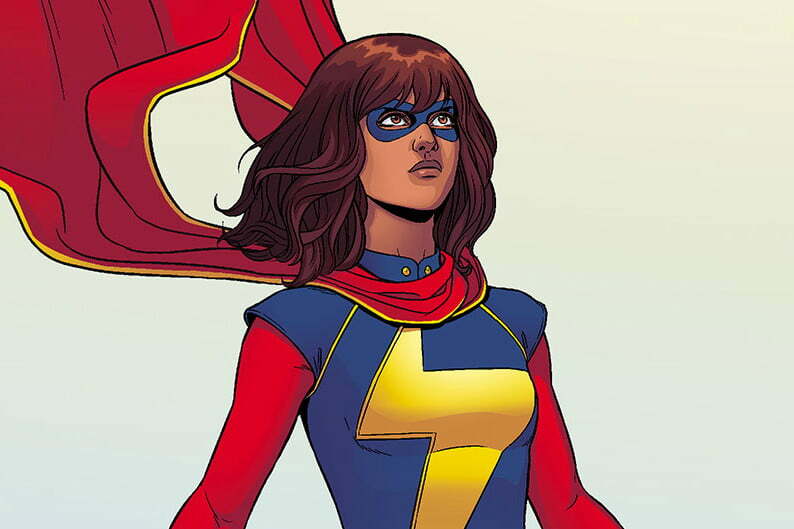 Something is in the works for Kamala Khan, aka Ms. Marvel, and actors Mindy Kaling and Riz Ahmed are ready to get involved. In a recent BBC interview, Marvel Studios president Kevin Feige confirmed that the company is currently working on Captain Marvel, but that it also has plans for her younger counterpart, Ms. Marvel. Not long after, Ahmed and Kaling tweeted about the possibility of writing a Ms. Marvel screenplay. Ahmed floated the idea on May 15, nominating himself, Kaling, and fellow actor Kumail Nanjiani to co-write the script. We don’t know how serious Ahmed was about the idea, but Kaling seemed very into it. She soon responded and shared just how “obsessed” she is with the comics. This could be more than just Twitter talk. Ms. Marvel writer G. Willow Wilson got on board with the idea, as Entertainment Weekly pointed out. When Ahmed tweeted that he and Kaling would have to secretly let Wilson and Marvel editor Sana Amanat “call all the shots,” Wilson wrote back saying that they’d be honored to have the two actors writing the screenplay. At this point, however, it is probably premature to be naming writers. Feige confirmed that a project is “definitely sort of in the works,” but that the movie Captain Marvel comes first. Feige declined to give any details regarding how the company plans to introduce Ms. Marvel. It’s possible she could be getting her own movie or could co-star in the Captain Marvel sequel (and if you’re curious about that film, we’ve got all the details you could possibly want). Alternatively, they could introduce her via a Netflix series. The Netflix series have tended to showcase heroes with simple powers such as super strength, however, and Khan’s shapeshifting might be difficult to do on a TV show budget. It will also be interesting to see how Ms. Marvel ties into the Inhumans storyline that the MCU has worked into Agents of Shield and the ill-fated Inhumans TV show. While Agents of Shield is still on the air, Inhumans was plagued by poor reviews and low ratings, resulting in its cancellation after a single season. It’s possible that Marvel may use Ms. Marvel as a means of giving the Inhumans a clean slate. Despite being a relatively new character, Ms. Marvel has quickly become one of the company’s more popular characters. Created in 2014 by writer Wilson and editor Amanat, Ms. Marvel made her debut the same year. A bubblegum-chewing superhero fangirl, Kamala Khan spent most of her free time writing fan fiction until the Terrigen Mists unleashed her latent Inhuman DNA. Using her shapeshifting powers and her giant teleporting dog, Lockjaw (who we hope will make it into the movie), she defends Jersey City, and occasionally the world, from a wide range of threats. Aside from the fact that the project is in the works, details are scarce regarding how Khan will make her entrance into the MCU. We’ll update this story as more news becomes available. Updated on May 17: Added information about Ahmed and Kaling’s interest in the project.